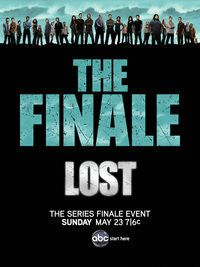 We will pay the price, but we will not count the cost"
The end is here for one of my all-time favorite shows: LOST. When it first started in 2004, I was one of the ones that said "How are they going to make a show out of this? They crash on an island in the middle of nowhere, and then what?" I normally like supernatural or sci-fi stuff, but I didn't start watching Season 1 until ABC started rerunning it for that Summer, and I was hooked! It's been a complicated show full of surprises, and I really grew to love it. The writers are ultra intelligent in their manner of connecting characters, plot twists, time traveling, and flashbacks! Even the writers know why people that don't watch the show say "Why do you watch that show!?! It doesn't make any sense!" Haha! But he journey has been unbelievably fascinating to this true LOST fan. The pre-show starts at 6pm with a 2 hour review special to absorb everything the loyal viewers have come to learn on the show. The finale starts at 8pm on ABC! And after all the sadness and bittersweet feelings, I will get some comic relief from Jimmy Kimmel, who will have the LOST cast and some alternate endings on his show tonight at a special time after the news. Here's some more comedy: A Sally O'Malley clip with the Sopranos of all people discussing LOST! Enjoy.